The Kansas-Nebraska act led to the collapse of the Whig Party and the rise of the Republican Party, do you agree? Tulsi Voralia Thursday 20th October 2005 The Kansas-Nebraska act led to the collapse of the Whig Party and the rise of the Republican Party, do you agree? 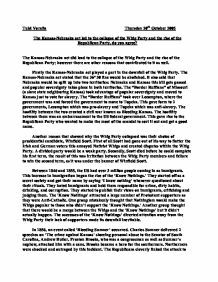 The Kansas-Nebraska act did lead to the collapse of the Whig Party and the rise of the Republican Party; however there are other reasons that contributed to it as well. Firstly the Kansas-Nebraska act played a part in the downfall of the Whig Party. The Kansas-Nebraska act stated that the 36� 30 line would be abolished. It also said that Nebraska would be split up into two territories: Nebraska and Kansas this bill gets passed and popular sovereignty takes place in both territories. The "Border Ruffians" of Missouri (a slave state neighboring Kansas) ...read more. A divided party would be a weak party. Secondly, Scott died before he could complete his first term, the result of this was irritation between the Whig Party members and failure to win the second term, as it was under the banner of Winfield Scott. Between 1846 and 1855, the US had over 3 million people coming in as immigrants. This increase in immigration began the rise of the 'Know Nothings.' They started off as a secret society and got their name by saying 'I know nothing' whenever questioned about their rituals. They hated immigrants and held them responsible for crime, dirty habits, drinking, and corruption. They started to publish their views on immigrants, criticising and judging them. ...read more. Many northerners began to feel that the slave power in the south was a huge threat to their freedom. So people started to support the republicans anti slavery ideologies rather than the 'Know Nothings' anti-immigrant and anti-Catholic ideas, as their freedom was more important. The Kansas-Nebraska act was a key reason to the rise of the Republicans and the downfall of the Whigs, but it was not the only reason, as there were some events, such as their poor presidential candidate and the rise of the 'Know Nothings' that gave the Whigs a bad reputation, forcing them to decline. Reasons such as Bleeding Sumner and slave power in the south showed how the Republicans were able to rise and become popular. The Kansas-Nebraska act on its own would not have had the same impact on the two parties, if it were not for the extra reasons. ...read more. Corruption has a devastating effect on the legal system. It distorts law making, court ruling and law enforcement and in the end, erodes the rule of law. This has devastating consequences for the society as well as economic activity. The legal system is one of the fundamental Polaris of a market economy whose role as arbiter of the law encompasses both the formulation and implementation of public policy. The Rise and fall of the Ottoman Empire. This bureaucracy in turn controlled local governments. This type of system would carry on to be the European model during the seventeenth century. Other such institutions and practices included: Observance of government: The Sultan's main role was to keep watch on officials. In December 1917, an armistice known as the Treaty of Brest-Litovsk was signed with Germany, and despite some harsh agreements within the treaty, Russia was out of the war. Furthermore, Lenin passed decrees that immediately satisfied the people. For example, Lenin passed the Land Decree, which called for all land to be withdrawn from commerce and transferred to peasant communities.